- A multi cuisine restaurant, specializing in North Indian Cuisine, the Cube boasts of an extensive menu offering Continental, Thai and Chinese choices. - Buffet breakfast and weekday Lunch Buffets are an additional boon for the busy corporate traveler. - Outdoor catering for private and corporate events is available from the Cube. - Our in-house multi-cuisine restaurant caters to every palate with a spread that is not only exquisite but also healthy. The restaurant at RB Hospitality Serviced Apartments, Bangalore serves brilliant multi-cuisine delicacies. It operates from 7.30 a.m. to 3.30 p.m. and again from 7.30 p.m. to 11.00 p.m. 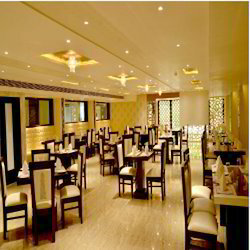 It is also renowned for its ambience and great service. Piano, the multi-cuisine restaurant at Lotus Park Hotel, Bangalore, is one of the best restaurants in Marathahalli, Bangalore. It serves buffet breakfast, and a-la-carte lunch and dinner. The Melange, framed by a spectacular view of the pool, and basking in the glory of natural light offers you an exquisite selection of Indian and International cuisine, not to mention an array of the famed Coorgi cuisine. Served as plated meals or bulging buffets. Lotus, multi-cuisine restaurant serves buffet breakfast, a-la-carte lunch and dinner. Fenix is our multi cuisine restaurant. At Fenix, we serve complimentary breakfast every day for our hotel guests. We also serve buffet lunch & dinner for Rs. 249 plus taxes. If you are in the mood for something specific, we also offer an al a carte selection for dinner. The Restaurant offfers a delicious range of veg and non veg dishes. At holiday palms, we offer a distinctive dining experience. one that explores the nuances of the finest indian and international cuisins, serving traditional and contemporary favourites. We are engaged in providing services such as restaurant services. From Breakfast to Dinner a enchantment for the traditional Veggie Cuisine.